This is one of those posts where it's a "Why didn't we do this sooner?" kind of thing. Our chair project was actually quite fun! Seriously. Fun. Because we bought a paint sprayer! We purchased the Graco Spraystation 2900. (Key word "purchased". Graco doesn't know about us.) 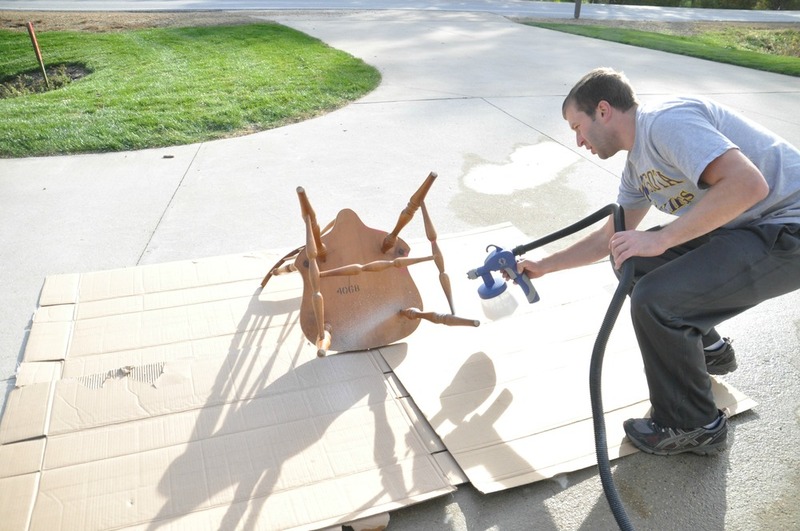 We decided to break down and buy a paint sprayer because we needed a more economical way to paint furniture. Spray paint is expensive and I was using a lot of it. We have a ton of paint in our basement that needs used. Welcome to your new home little paint sprayer. We decided to go with the Graco Spraystation 2900 paint sprayer based on reviews in Family Handyman. HVLPs are quieter than other pump sprayers. There is less over spray. The paint dries faster. It has a fine finish that is good for furniture. The paint sprayer is easy to use. We found that you need to use small strokes and keep the nozzle a consistent distance away from the piece of furniture. It's best to move your whole arm and not just your wrist. Ladies, I recommend this paint sprayer because then your husband will be all like "Yay. New toy. Will paint wife's furniture for her." Wise investment. This paint sprayer is so fantastic that we were able to complete three coats (primer and 2 coats of paint) in 1 hour. I would still be painting these chairs 3 weeks from now without it. Best DIY investment we've made in a long time! Here's round 1, the primer. Next is where things get crazy. We hemmed and hawed on what color to paint the end chairs. We wanted them to stand out but we were also nervous about them being crazy. We decided to go big or go home and try a color. We went Olympic's Gold Buttercup. Which is perfect because one of my favorite sayings lately is "What's up, Buttercup?" It's bright. We think we like it. It's a little bolder than our traditional style. But it's growing on us. Or is it too bold? Eh. It's only paint. If we don't like it, we'll bust out the paint sprayer again! What do you think of the color? Be kind. :P Are you a fan of the ol' paint sprayer?